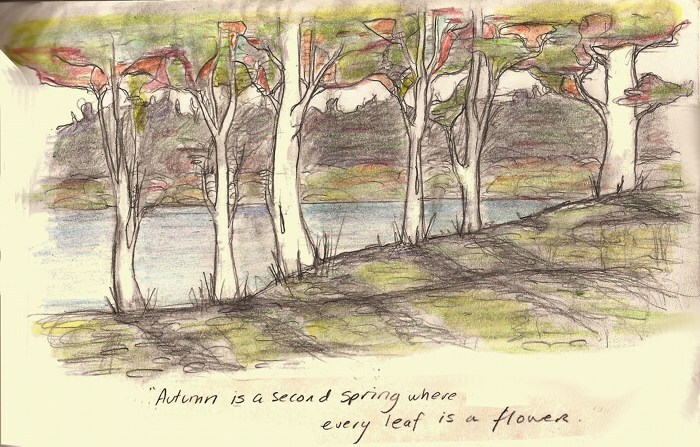 This entry was posted in Philosophy and tagged autum is a second spring where every leaf is a flower, autumn is a second spring, autumn quote, camus autumn, fall quotes, philosophy webcomic, simon and finn by simonandfinn. Bookmark the permalink. What a lovely, lovely poetic thought! And such a pretty scene in your drawing / painting (?). Did you add the colour on paper on or on the computer? I’m trying out a bit of colour.. I did it on paper beforehand using pencil crayon. Less finicky than via computer! Happy colouring in the season of colours.